Mortgage interest rates are at or near all time lows, but many applicants face rejection when they apply for a loan, according to many sources I've read. Both the Realtors (National Association of Realtors) and the home builders (NAHB) regularly and loudly complain about highly restrictive lending guidelines that enable lenders to deny loans to many applicants. 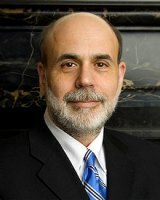 Now comes a most unusual rejectee: former Federal Reserve Chairman Ben S. Bernanke. Bernanke was a speaker at a Chicago conference Thursday, Oct. 2, 2014 and he told moderator Mark Zandi of Moody's Analytics Inc. "just between the two of us"…. "I recently tried to refinance my mortgage and I was unsuccessful in doing so." When the audience laughed, the Augusta, GA native -- who grew up in Dillon, SC -- said "I'm not making that up." From the Tribune story: "Bernanke, addressing a conference of the National Investment Center for Seniors Housing and Care in Chicago ... said that the first-time home buyer market is 'not what it should be' as the economy in general strengthens. 'The housing area is one area where regulation has not yet got it right.'" According to the most recent -- Oct. 2, 2014-- Freddie Mac mortgage rate survey, a "30-year fixed-rate mortgage (FRM) averaged 4.19 percent ... for the week ending October 2, 2014, down from last week when it averaged 4.20 percent. A year ago at this time, the 30-year FRM averaged 4.22 percent. A 15-year FRM this week averaged 3.36 percent ... unchanged from last week. A year ago at this time, the 15-year FRM averaged 3.29 percent." I don't know what kind of mortgage Bernanke, 60, wanted -- I'm guessing he'd go for that ultra low rate 15-year fixed-rate mortgage -- but maybe the Realtors and homebuilders have a point. At least they've got Bernanke on their side! Bernanke served as the 14th chairman of the Fed, from Feb. 1, 2006 to Feb. 3, 2014. He served both Presidents George W. Bush and Barack Obama. He's now a Distinguished Fellow in Residence with the Economic Studies Program at the Brookings Institution.